An automatic smart card personalization system, suitable for users wanting decentralized production of ID, EMV and GSM cards, was demonstrated at CARTES by Muehlbauer, a manufacturer of turnkey automation solutions for smart card and smart label production. The Scope 5400 system is freely configurable and highly flexible due to its modular design. Muehlbauer, a leading manufacturer of turnkey automation solutions for smart card and smart label production, exhibited its advanced, high speed card personalization system at Cartes & IT Security 2004. The Scope 5400, a fully automatic smart card personalization system, is ideally suited for users preferring decentralized production of ID, EMV and GSM cards. The Scope 5400 is a compact manufacturing system, freely configurable according to customer requirements and highly flexible due to its Modular structure. The system features a central user terminal with graphical user interface and reduced card transport distance to the handling stations. The system, which personalizes ID-1 format cards, can process virtually any type of material: PVC, PC, ABS, as well as other materials upon request. The automatic card transport system of Muehlbauer¹s Scope 5400 is designed to simplify the card handling operation, which is fast and effective, thus allowing to cut down manufacturing time. 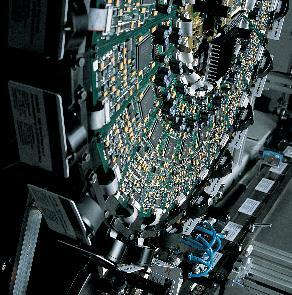 Moreover, gentle card handling by proven Muehlbauer devices guarantees the highest card quality and the least defects. The Scope 5400 can be fitted with 4 to 20 chip encoding stations, an arbitrary amount of laser modules with CO2 or diode grayscale lasers of different power ratings, several types of inkjet printing modules, magstripe encoding stations, embossing and thermal printing modules. Designed with performance and process demands in mind, the Scope 5400 is highly customizable, and new modules can even be added at the customer¹s site. The new pneumatic input and output stacker systems handle up to 500 cards each in Muehlbauer standard magazines. A throughput of up to 1500 uph can be achieved by handling chip encoding times of up to 45 sec. The excellent reliability of the Scope 5400 guarantees yields in the order of 99.7%. The small footprint and compact design of the Scope 5400, with subsystems fully integrated in the basic construction, make this manufacturing solution ideally suited to face the most demanding space constraints. Ergonomic features and appealing design complete the high-profile construction of the machine, typical of Muehlbauer products. Through the use of additional inspection systems, such as vision cameras and data verification modules, the Scope 5400 can be quickly and securely configured as a fully automatic system for high quality card production with 100% testing of personalized cards. Muehlbauer is a global, independent consultant and manufacturer of turnkey automation solutions for the smart card, smart label, semiconductor backend and vision industries. In addition, the company is active in the areas of data enrollment and verification, precision parts and OEM production. With about 1,400 employees in 22 locations on five continents, Muehlbauer is a leading supplier of production equipment for the smart card industry. Muehlbauer solutions enable to manufacture any type of chip card, including ID cards, contact and contactless cards, dual interface as well as multimedia cards and smart labels for access control, supply chain management, tracking of textiles and applications for the retail industry. Information on Muehlbauer is available on the Internet at www.muehlbauer.de.